Start from the rainy streets and continue the heist in upper levels – Thief casino slot game is based on a high-tech theft story. NetEnt online slots decided to go with a futuristic art style in the game and the graphics look lovely because of that. The game has 5 reels, 25 pay lines and a double scatter feature which increases your winning odds. Try this if you like to play casino slots online with sci-fi themes – these games are rare and valuable. Thief online slot game by NetEnt uses numbers, letters and a set of thief tools as for symbols. 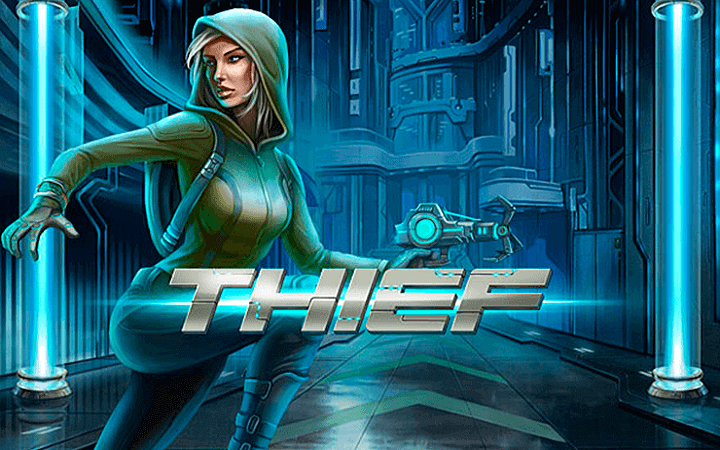 Thief tools are futuristic and five in total, with a payout range of 10 to 500 coins. It is nearly impossible to describe them because they look like… well, alien tools. But all of them are cool looking! The game uses wild and scatter symbols as for special symbols. The wild symbol is shown with the picture of our female thief. It substitutes all other symbols (except scatter) and can appear only on reels 2, 3 and 4. Wild symbol has the “expanding” feature, in other words, it expands to cover the entire reel it appeared on and form the full-size picture of the thief. As for scatter symbols, there are two. The first one is the ordinary scatter and shown with a blue disc symbol. If it appears on reels 3, 4 and 5 at the same time, you are awarded 10 free spins. This feature can get re-triggered if you continue to land scatters on the reels. The other one is called “adrenaline scatter” and shown with an orange disc symbol. This one also awards with 10 free spins if it appears on reels 3, 4 and 5 but with one difference: during the adrenaline scatter free spins, another symbol is added to the reels. This symbol is in the shape of a diamond and has a payout value of 5.000 coins. The coin values can be set between 0.01 and 0.50 coin. Playing with maximum bet values cost 125 coins, but you have a chance of winning 68.850 coins if you prefer to play like this. Overall, we liked what we see – you can try the free slots no download version of the game to decide for yourself.